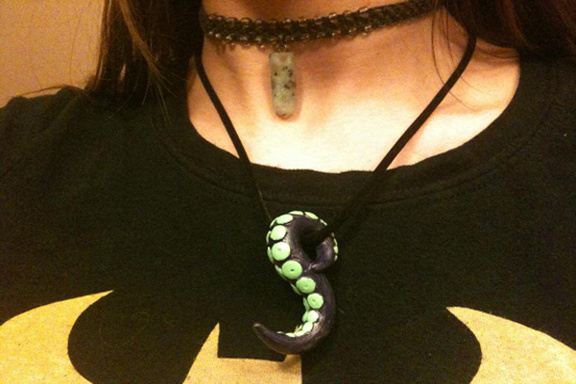 I made a tentacle necklace for myself today. It came out alright. Looked a lot better before I painted it. I gotta find a new way to paint these things. Also would like to find a new way to make the suction cups. I plan on making more. Huh? I think the colors go perfectly for a tentacle. As a side note, you might consider having six or eight tentables on a necklace, with each of them being painted one of the colors of the "gay rainbow". Might be kind of colorful. Of course the tentacles might have to be a bit smaller to get that number of them on a necklace. Yes I have already thought of making one for ever color of the rainbow. =3 (Which is the same as the gay rainbow. lol) Never thought to put them all on one necklace though. Might be kinda tough to work that small, but could come out pretty cool.